The secret of good cooking is to cook with love—or so my mother taught me when I was a little girl. We should love the creative act of cooking. We should love and respect the ingredients we use. And we should love those for whom we cook. Most of the time all this love comes naturally to me. If I didn’t find the act of cooking fulfilling, I wouldn’t be a food writer. I enjoy watching different foods ebb and flow in farm stands and grocery stores as the seasons shift. And I get great satisfaction from cooking for, and eating with, my family and friends. Food is part of our communal life. Last week, however, was NOT my most loving time in the kitchen. We’ve all had so-called bad hair days. I had a bad food week. It took me a while to realize what the problem was. All I knew was that just about everything I made (including recipes I was testing for publication) turned out somewhere between barely adequate and (shudder!) pretty awful. Usually, the range is from tasty to fabulous. Friday afternoon I suddenly observed that the joy had gone out of my kitchen. I was viewing cooking as a task instead of a pleasure. The problem wasn’t with cooking, of course. It was with me. 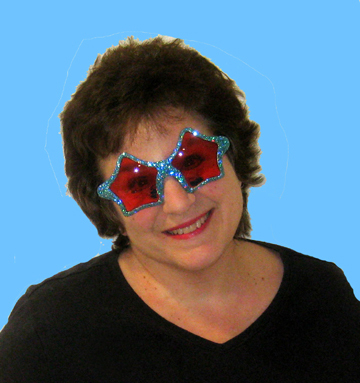 I think my frazzled state might have been induced in part by the time of year. We have more sunshine now than we did in February—and the air is definitely warmer. Nevertheless, spring hasn’t quite hit the ground running yet. And summer seems a long way off. To tackle the problem I turned off the stove and the computer and made myself a list. (I love lists!) The list was a bit of a hodgepodge because it had a dual purpose: to make me feel better in general and to help me return to work and cooking with a more cheerful and loving heart. Here is my list. Obviously, this list won’t work for everyone. It might inspire others, however. 1. 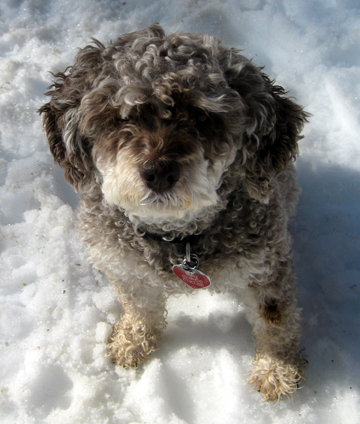 Take the dog (or the child or the cat or the ferret or whatever you have) for a long walk. Even on rainy days at this time of year one can smell spring in the air! And it’s good to get the body exercising as well as the brain. 2. Do something to cheer up someone else. When I got back from the walk I took my mother for a drive (she’s not in shape yet to go walking with Truffle and me). Making her happy made me happier. 3. Listen to–or better yet make!–some music. It’s the food of love, so it’s bound to help restore the love of food. 5. Simplify tasks. I knew I had to return to the kitchen. So I vowed that my next few recipes would be easy ones that took advantage of ingredients I already had in the house or could get very easily. Making cooking easy was the first step toward making it a joyful and loving experience again. I may not be ready to make a soufflé or a cassoulet at this point, but I’m back to cooking with enthusiasm and making meals that I and others can enjoy. Here is one of the simple recipes that helped me get there. It’s perfect for this time of year since we’re still in maple month…… Remember, spring is a time of renewal! This three-ingredient appetizer recipe comes from a delightful cookbook titled Fry Bacon. 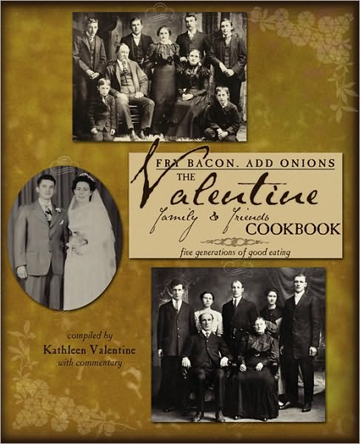 Add Onions: The Valentine Family & Friends Cookbook. A new edition of this book by Kathleen Valentine of Gloucester has just been published by the Parlez-Moi Press. I enjoy the way Kathleen weaves reminiscences, photos of family and friends, and recipes into an attractive volume that shares her family’s life and many of its loves. She comes of Pennsylvania Dutch stock so the book features many of my favorite sweet-and-sour combinations. Tammy Hicks of Charlemont, Massachusetts, gave me a similar recipe last year using grape jelly and barbecue sauce. Sweet and saucy, both recipes make excellent finger food (toothpick food, actually) for large parties. 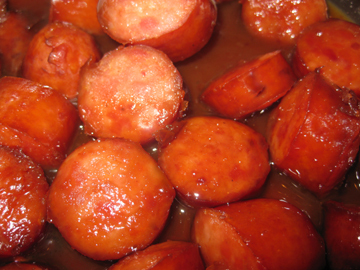 Kathleen’s original recipe calls for 3 to 4 pounds of sausage, 1 cup brown sugar, and 1/2 cup maple syrup. I was serving fewer people so I reduced her proportions. Brown the sausage pieces lightly in a frying pan. 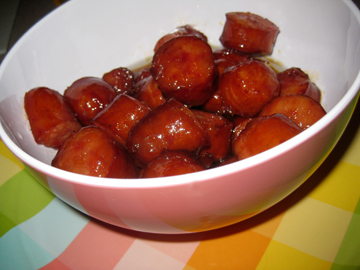 Transfer them to a 1-1/2 quart saucepan, and stir in the brown sugar and maple syrup. Bring to a boil over medium-high heat, stirring constantly; then reduce the heat and simmer, covered, for 1 hour, stirring from time to time. Serves 8 as an appetizer. Today, March 24, is Ada Lovelace Day. Organized by Suw Charman-Anderson, a British writer and social-software consultant, the day pays tribute to women in technology and science. It is named after Augusta Ada King, the Countess of Lovelace (1815-1852), who is credited with writing the first computer programs. She created them for the Analytical Engine, an early computer prototype thought up (but never actually built) by Charles Babbage. Suw has gathered bloggers from all over the world to write today about their heroines in science and technology. I minored in astronomy at Mount Holyoke College. My original concept for Ada Lovelace Day was to interview a young astronomy student at the college. (Mount Holyoke is a women’s college so she would certainly have been female.) I wanted to ask her about her attitude toward astronomy and her career aspirations. Instead of abandoning Suw and her cohorts, I thought I’d write briefly about my own reasons for studying astronomy during my time at Mount Holyoke in an attempt to honor female astronomers everywhere. Part of my love for astronomy stemmed from the sense of history I felt working in the Williston Observatory. Built in 1881, it is the oldest academic building in use on the Mount Holyoke campus. This homey wooden structure welcomed my mother and my grandmother and generations of other young women who studied at Mount Holyoke. 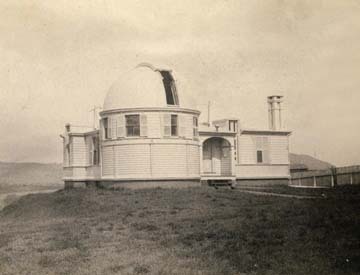 All of them—all of us—used the observatory’s original Alvan Clark Refractor telescope, although it has since been joined by newer telescopes. My love of astronomy goes beyond my affection for that building, however. I firmly believe that everyone should study astronomy. It’s the perfect liberal-arts subject. At its grandest—in its subfield of cosmology—astronomy is literally the study of EVERYTHING. It attempts to answer the deepest philosophical as well as scientific questions that confront humans. Where did we and our world come from? What motivates us (that is, what are the basic forces of nature)? At its smallest—in its subfield of quantum mechanics—it asks what we are made of and how we can predict the future. Astronomy and its sister field of physics answer both small and large questions in people’s daily lives. They help us lift groceries and steer our cars through curves. They also help us fly the Space Shuttle and design computers such as the one on which I’m typing this essay. In addition to touching on other branches of science and history, astrophysics has had a huge influence on many other academic fields. It’s hard to picture humanism without the principles and work of Darwin, modernist literature and art without relativity, or postmodernism without quantum mechanics. On a less academic and more personal scale, I find the night sky both challenging and reassuring. In some ways, the stars daunt us humans. They present evidence of a huge impersonal universe that doesn’t care about us. Celestial bodies are also our friends, however. I amuse myself looking at the constellations and thinking about the ancient souls who traced their shapes and named them. I enjoy knowing that the position of the stars can tell me where I am on the globe. And the moon—well, to me she’s like a beautiful cousin. Her moods come and go, but she’s a constant in my life, whether I’m in Hawley, Massachusetts, or Paris, France. I hope you’ll take a few minutes this evening to look at my cousin (she’s just beyond the quarter moon phase right now, on her way to the full moon that will bring us Passover and Easter) and her stellar companions. Think of young women (and men) exploring the past and future of our universe—and of Ada Lovelace and all her sisters in scientific endeavor. 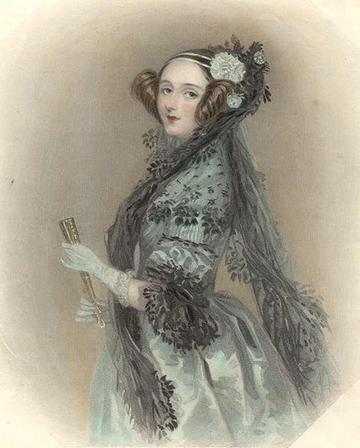 For a list of blog posts participating in Ada Lovelace Day, visit its official site. And for a delightful set of historical postcards of Mount Holyoke’s Williston Observatory put together by an alumna, please visit this online photo gallery. The comets are a cool idea in both senses of the world. Unfortunately, the recipe calls for liquid nitrogen, which I don’t have in the house. 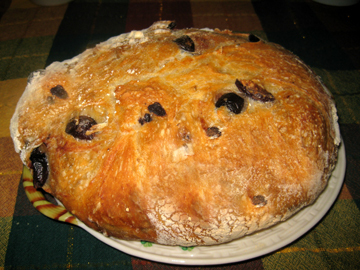 I ALMOST made raisin bread, which my Mount Holyoke professor Tom Dennis cited in Astronomy 101 to help students understand the expanding universe. He suggested that our situation here in the Milky Way galaxy is comparable to that that of a raisin in a rising loaf of raisin bread. It looks as though all the other raisins (the rest of the universe) are receding from us, and we get the feeling that we’re in the middle of the loaf. We aren’t necessarily, however. I love the raisin bread analogy because I adore food analogies—and because it brings up a major question of science and indeed of humanity: Who, if anyone, is baking this loaf of bread? I just posted a bread recipe a couple of days ago, however, so I decided to save the raisin bread for next year’s celebration of Ada Lovelace Day. 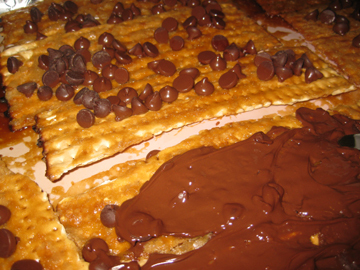 Today I am instead delighting my nephew Michael by making cookies that include Milky Way® candy bars. Ada Lovelace sounds like a smart cookie so these treats seem appropriate for her as well as for the topic of astronomy. The folks at Mars USA insist that the original 1923 candy bar was named after a popular malted milk shake and not after our home galaxy. Nevertheless, I’m pretty sure the shake must have been named after the galaxy so I feel comfortable using the candy in this post. 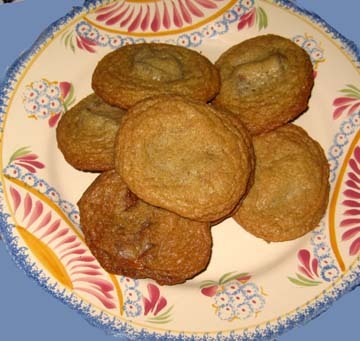 The internet is rife with Milky Way® cookie recipes. Most of them use a peanut-butter base. I wanted to let the subtle flavor of the candy shine, however, so I combined the bars with standard chocolate-chip-cookie dough. 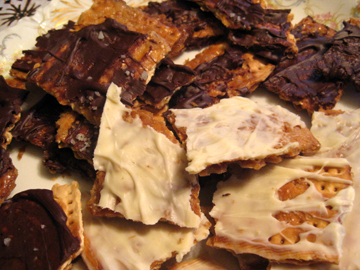 I tried cutting the candy up into tiny pieces and mixing it directly into the dough, but my family preferred the method below, in which the candy is completely surrounded by cookie. The day before you want to eat the cookies cream together the sugar and butters. Beat in the eggs, 1 at a time, mixing well after each addition. Beat in the salt, soda, and vanilla; then gently stir in the flour until it is completely incorporated. When you are ready to bake the cookies preheat the oven to 350 degrees. 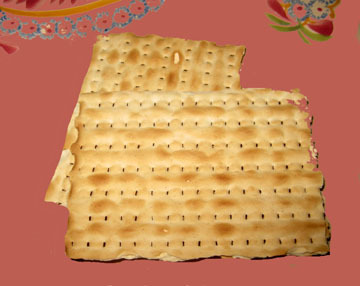 Line cookie sheets with parchment paper or silicone mats. Form the dough into 36 balls, each a little over 1 inch in diameter. Flatten each ball; then place a half candy bar in the center. Wrap the cookie dough around the candy bar so that it forms a ball again, completely covering the candy. Place the balls on the cookie sheets, being careful to make sure there is dough (not cookie) under the surface of each ball. Bake the cookies until they are golden brown (about 15 minutes). In some of them you may still see the outline of the candy bar; this phenomenon didn’t bother my family at all. Let the cookies cool on the sheets for just a minute or so. As soon as you can lift them without causing them to fall apart, remove them to wire racks to cool. If they cool much on the cookie sheets, they will be difficult to remove from the parchment or silicone. Allow the cookies to cool before you eat them. Makes 36 clusters. “No Knead” Is a Terrible Name! I’ve never been particularly trendy as a cook or as a person. Perhaps this is why it has taken me longer than most to jump on the “no-knead bread” bandwagon. Many home and professional cooks ran out and made a loaf shortly after reading Mark Bittman’s ground-breaking column in The New York Times in November 2006. I have heard stories (probably apocryphal but fun nevertheless) that grocery stores ran out of rapid-rising yeast, an ingredient called for in Bittman’s formula, that day. The recipe Bittman used came from Jim Lahey of Manhattan’s Sullivan Street Bakery. Lahey has since published My Bread: The Revolutionary No-Work, No-Knead Method. From 2006 until 2010 I was unmoved by all this brouhaha. “So what if it doesn’t require kneading,” I thought. I don’t mind kneading bread. It’s a simple, enjoyable task that doesn’t take very long. When I’ve been writing for several hours I love the physical break kneading provides. So I tried the bread. It was amazing. 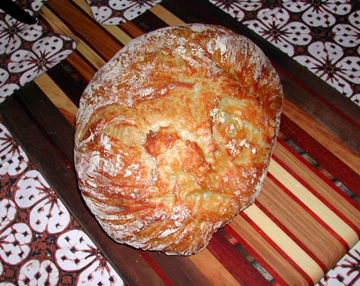 Note to Mark Bittman and Jim Lahey: “No-Knead Bread” is a misleading name. It should be called AWESOME Bread. Or Parisian Bread. Or Artisan Bread. Or anything that emphasizes the product rather than the process. The bread works because it combines just a little bit of yeast and a LOT of water with the basic flour/salt mixture. It then lets them rise together for a really long time. The process concludes by baking the bread in a preheated pot in a really hot oven, which almost replicates a brick oven. I’ve tried a few variations. Bittman later proposed making bread almost as good by using more yeast and letting the bread sit for less time. (You’ll note that his original recipe takes about a day.) I encourage you to try this method. For my most recent loaf I added some nice salty Greek olives to the mixture. This is the version for which I share the recipe. The biggest trick to making this bread may be selecting the pan. You need a heavy pan with a volume of 4-1/2 t 5 quarts that can withstand a 450-degree oven. If your pot has a plastic lid-grabber, I am told that you may unscrew it and put foil in its place. (Opening the pot may be harder in this case.) Amazon.com sells Lahey’s book along with a 5-quart Lodge cast-iron Dutch oven that looks useful (and a lot less costly than my beloved Le Creuset). One more variation: If you want to use instant or rapid-rise yeast, the water should be lukewarm instead of hot as mine was for regular yeast. The day before you want to eat your bread, combine the flour, salt, and yeast in a bowl large enough to hold more than 2 quarts of dough. 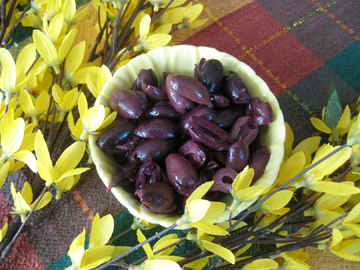 Stir in the olives, followed by the water. Mix with a wooden spoon until it the dough is combined (it will be messy! ), about 30 seconds. Cover the bowl loosely and let it sit in a warm place until the dough doubles in size and bubbles form on the surface, 12 to 18 hours. Do not put the dough on a radiator (I speak from experience) as it will dry out. Generously dust a board with flour, and using 2 wet spatulas dump the dough onto the board. Lift the edges of the dough with the spatulas into the center and nudge it into the shape of a ball. Dust a linen dishtowel with flour, and use the spatulas to pop the dough onto it, seam side down. If the dough is sticky (it always is, in my experience), dust the top with flour or cornmeal. Fold the ends of the dishtowel around the dough so that it is loosely covered. Allow it to rise in a warm spot for 2 hours, or until it holds the hole when you poke your finger into it. About 1/2 hour before the second rising is complete, preheat the oven to 450 degrees. Place a covered 4-1/2- to 5-quart pot on a rack in the lower third of the oven and allow it to preheat along with the oven. When the half hour is complete, use heavy pot holders to remove the pot from the oven and uncover it. Gently but quickly slide the bread dough into the pot, shaking the pot a little to distribute it in its ball. Cover the pot and replace it in the oven. Bake for 30 minutes; then uncover the pot and bake for 15 to 30 minutes more, until the bread is a gorgeous brown color. Carefully remove the pot once more and use pot holders or a heat-proof spatula to remove the bread from it. Allow it to cool on a rack. Makes 1 gorgeous, aromatic loaf. Here is the bread without olives (but with more salt and less yeast), also fabulous. I haven’t tried the recipe, which came from Parker’s wife Marcella. I think I’ll make it later this week in his memory, however. After the article came out Parker sent me a couple of bottles of wine. Better yet, he included a black-and-white beefcake poster of himself in his heyday lounging in a bathtub as Davy Crockett. Unfortunately, my cat Lorelei Lee destroyed the poster by licking it. I guess the handsome Parker was catnip to females of all sorts. Reading the interview today, I’m impressed with what a convincing actor he was even as a businessman—the presentation of his business as natural, the aw-shucks modesty of his comments about Walt Disney (with whom he had serious disagreements because Disney controlled his contract), the general aura of Americana in which he cloaked himself. I’LL FESS UP…. I’ve got a crush on a California vintner who is old enough to be my father, married, and my political opposite. Fess Parker, who’s in his late 60s, looks darn good. 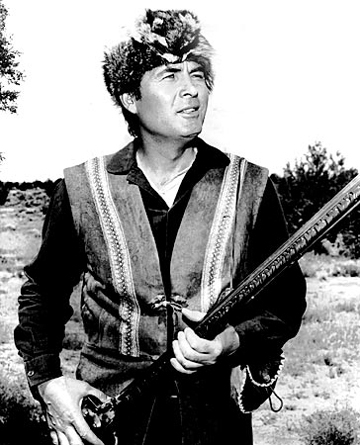 He occasionally dons a coonskin cap like the ones he inspired millions of children to buy when he played television’s Davy Crockett (1954-1955) and Daniel Boone (1964-1970). And his voice retains the Southwestern twang that laced those portrayals with sincerity. Despite the corniness of the line my cynical heart went pitter-patter. 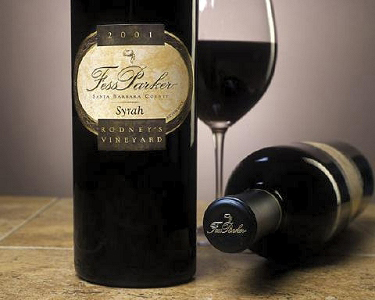 Parker now serves as spokesman for the Fess Parker Winery and Vineyard in the Santa Ynes Valley in Santa Barbara, California. The winery’s first vintage appeared in 1992, and its products have attracted favorable reviews in wine periodicals. 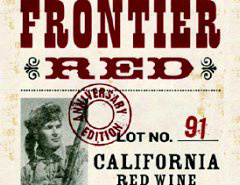 Bottles of Fess Parker chardonnay, Riesling, pinot noir, merlot, and syrah—with tiny coonskin caps on their labels—are now available in the Boston area. Parker is proud of the fact that his is a family enterprise. His son Eli manages the vineyard and serves as winemaker. 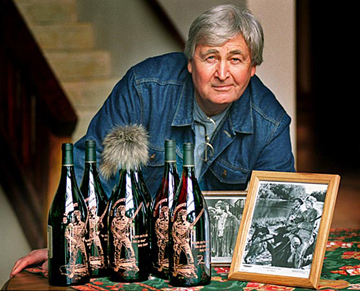 His daughter Ashley supervises tastings and organizes a popular Fess Parker wine club. And his wife Marcy helps him operate the winery and creates recipes to accompany different wines. The Parker spread runs to 714 acres. “In Texas, where I’m from, we’d call that a horse pasture,” laughs Parker. “But here in Southern California to have that many acres and most of them level is quite unique.” He expects to produce about 20,000 cases of wine this year. Nevertheless, at a certain level the politically conservative Parker seems to feel a genuine identification with the pre-industrial heroes he portrayed in film and on television. “I grew up on a farm and ranch part of my life—every summer from the time I was 6 until I was 16, in Texas,” he explains. “You know, we’re not all that far from the agricultural nation that we were. Parker wears coonskin partly in homage to Walt Disney, who chose the then unknown actor to portray Crockett on Disney’s pioneering television show Disneyland. Since his film and TV heyday in the 1950s and 1960s, Parker has continued to take advantage of opportunities offered him. He has parlayed his money, intelligence, and undeniable charm first into a real-estate career; then into ownership of a resort hotel in Santa Barbara (a second waterfront hotel is in the works); and now into the wine business, which he relishes. Parker, whom I interviewed over the telephone, told me he’d just LOVE to meet me in person. He didn’t offer me a plane ticket, however, so for the moment I’ll content myself with trying his wine—accompanied by one of his wife’s recipes. 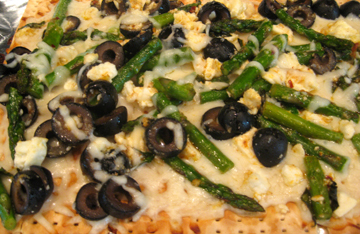 The Parkers use this savory pie as a main dish for a luncheon or a side dish for dinner. It is to be accompanied by the vineyard’s Riesling. Melt the butter in a heavy 10-inch nonstick ovenproof skillet. Sprinkle with sugar and remove from heat. Cut six of the onions in half, fit them snugly into the pan, cut side down, and pour the wine over them. Use more onions if necessary to cover the bottom of the pan. Cut the leek to the same thickness as the onion, and fit the slices into the spaces in the pan. Sprinkle with half of the thyme, the salt, and the pepper. Slice the remaining onions 1/4 inch thick and arrange them over the onion mixture in the skillet. Sprinkle with the balance of the thyme, salt, and pepper. Cook over medium-high heat for 5 minutes. Reduce the heat to medium, and cook for another 5 minutes, until golden brown. Shake the pan from time to time. Pour the stock and vinegar over the onions and bring the mixture to a simmer. Cover and cook for 20 to 25 minutes over low heat until tender. Remove the lid and raise the heat; cook until the liquid is syrupy and almost completely reduced. Remove from heat and cool in pan. The mixture will hold together. Blend the flour, salt, and butter in a food processor until the mixture resembles coarse meal. Add the thyme and shallot. 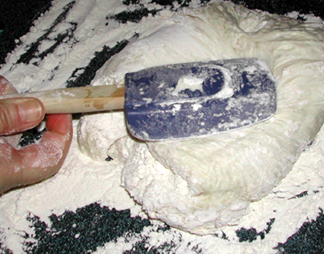 Process, adding water, until the dough just holds together. Form the dough into a flat disc; wrap and chill until firm, 30 minutes or more. Preheat the oven to 375 degrees. Roll out the pastry 3/8 inch thick, making sure it is slightly wider in diameter than the skillet in which the onions were cooked. Place the rolled pastry on top of the mixture in the skillet and tuck any excess dough into the pan. Transfer the skillet to the preheated oven, and bake for 30 to 35 minutes, until golden brown and bubbly. Take the pan out of the oven, cool it for 10 minutes, and invert onto a serving plate. Garnish with more thyme. Serve with a salad and steamed, chilled asparagus. Serves 6 as a side dish, 4 as an entrée.